Should you buy the blue sequinned stilettos or the champagne gold pumps? What’s trending this season, the classic floral or the edgy botanical prints? Will a sunshine yellow saree gown look good for a wedding cocktail? Looking for a cute dress to impress your boyfriend? Finding fashion was never easy, nor was getting the best stylists of the fashion fraternity to guide you through the ‘ouch’ moments. But now things have changed. Be it a popular Bollywood celebrity or an online store where you have millions of brands to take your pick from, download Roposo app on your android or iPhone for your fashion rescue and join 1.5 million fashion enthusiasts on the go. You can find inspiring stories on latest fashion and style hacks, how-tos, DIYs and Bollywood fashion. You can also see stories on your feed created by people you follow. It helps online shoppers to find the most relevant products according to their individual tastes, from anywhere on the web. Now you don’t need to visit 20 different websites to find that one perfect dress or make bottomless searches for the same dress your favourite fashion blogger suggested. It has more than 20 lakh products from Flipkart, Jabong, Snapdeal, Amazon, Koovs and 300 other web stores. From Biba to Vero Moda and from Steve Madden to Forever 21, you can pick your favourites from more than 5000 brands. Roposo has got it all. You can now join Roposo’s growing team by becoming a Roposo Fashion Ambassador (RFA) which is a program to discover the best fashion ambassador from each college. Participation will have to pass through a series of events to become the RFA of their college. Upload your most stylish picture on Roposo. Use hashtag #RFA along with #collegename, for eg. – #RFA #LSR. Show us how popular and liked your style is, in the given timeframe. Shortlisted entries from each college will advance to the next round. In the end 1 girl from each college will be crowned the Roposo Fashion Ambassador. Log on to http://www.roposo.com/campusconnect to know more! This post has been sponsored by Roposo. 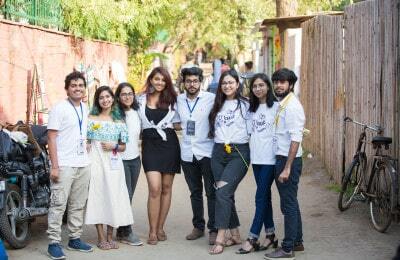 Previous PostTeam from St. Stephen's and Ramjas wins big at Comquest 2015 at Jesus and Mary College Next PostIndia Vision 2020- Are we there yet?